We all love a good storyline, and watching Russell Westbrook lead a Kevin Durant-less Oklahoma City Thunder squad into the playoffs while putting up historic numbers was the best story of the 2016-17 regular season. Westbrook pulled off the unthinkable, becoming the second player in NBA history to average a triple-double for an entire season. The Thunder superstar averaged 31.6 points, 10.7 rebounds, and 10.4 assists. The last one to accomplish that feat was the great Oscar Robertson. The Big O averaged 30.8 points, 12.5 rebounds, and 11.4 assists during the 1961-62 season. So, case closed, right. It’s Westbrook hands down? Wrong. 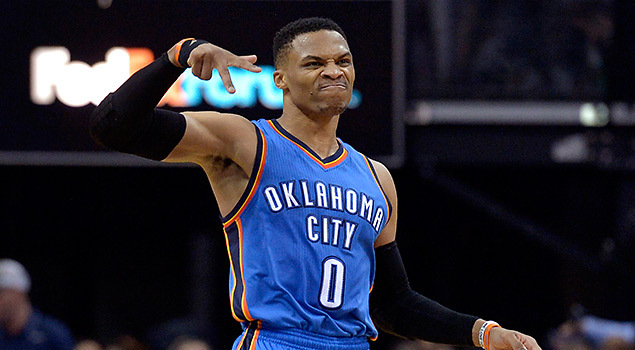 As great as Westbrook has been all season — and he was insanely good — it would be a mistake to give him the MVP award. That’s right. A mistake. Why? It’s all about history. Here’s a little history lesson. Oscar Robertson didn’t win MVP during his historic triple-double season in ’62. In fact, he finished third in the voting behind Bill Russell and Wilt Chamberlain. Wilt, who averaged 50 points and 25 rebounds in 1962, finished second. Second! The man averaged 50 points a game and he only got nine first-place votes. Russell was named MVP in ’62 because his Boston Celtics team won 60 games and finished first in the division. If the main argument for Westbrook for MVP is based on sheer numbers, then there is no argument. The precedent was set in 1962. Winning trumps individual records any time, any day. The most valuable player award should go to the player on the best team or winning team. The reason why Robertson didn’t win MVP in ’62 was because his team did not win enough games. Robertson’s Cincinnati Royals squad went 43-37 in ’62. Westbrook’s 2016-17 Oklahoma City team won just 47 games and finished sixth overall in the Western Conference. Winning matters at any level, whether it is in middle school, high school, college or pro. According to Elias Sports Bureau, the past 34 NBA MVPs’ teams have been ranked in the top three of their respective conferences in wins. In that stretch, only two were ranked outside the top two: Steve Nash in 2005-06 and Michael Jordan in 1987-88. Overall, 45 of the 61 MVP winners finished the season first in the conference and only 12 of those MVPs finished the season ranked first in triple-doubles. Westbrook had a phenomenal season, make no mistake about it. He deserves to be in the MVP conversation. If this were fantasy basketball, Westbrook is the runaway MVP. But this is not fantasy. This is real basketball, and the reality is Westbrook’s spectacular individual effort didn’t translate to enough wins. So who should win the 2017 MVP award? Kawhi Leonard, LeBron James, James Harden, and Steph Curry all are worthy candidates. Kawhi is arguably the best two-way player in the NBA and he led the San Antonio Spurs to the second-best overall record. LeBron posted better numbers this season (26-8-8) than any of his four MVP seasons. Harden was second in the league in scoring (29) and first in assists (11.4) while leading the Rockets to 55 wins. And while Curry may not have been as good as his 2015-16 version, he carried the Golden State Warriors to a league-best 67 wins despite Durant missing the last half of the season. Sorry, Russ. The triple-doubles were nice, but they’re not good enough to win MVP.